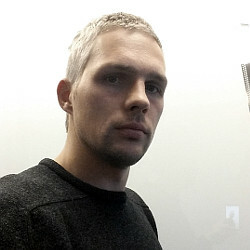 Settingsafari.com is the PUP that uses misleading techniques to prevent removal. Use Reimage to locate malicious components and get rid of them faster than with uninstall instructions. A full system scan blocks virus reappearance and prevents traffic to malicious domains. Are you wondering how did Settingsafari.com hijack your computer? How can I remove Settingsafari.com virus from my computer for good? Settingsafari.com is a deceptive website which can unexpectedly pop-up on your computer screen whenever you browse the Internet. 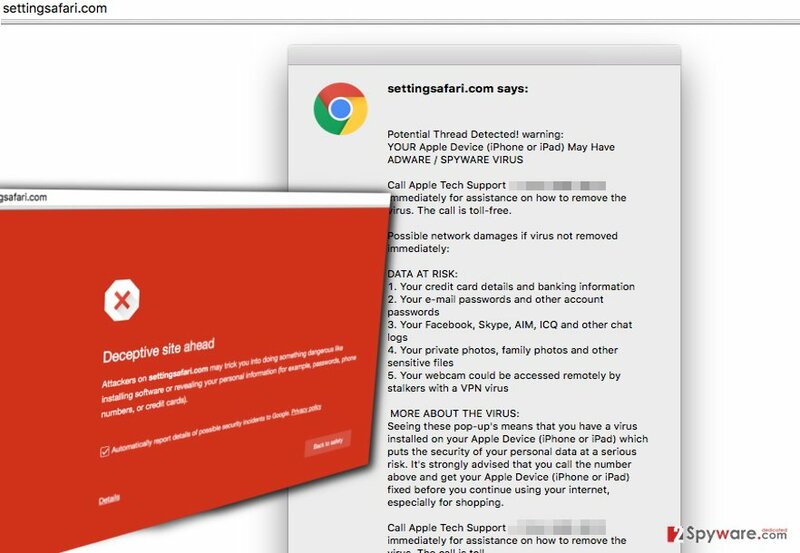 These pop-ups are related to Settingsafari.com potentially unwanted program (PUP), also known as adware. This program can be installed unintentionally alongside other free programs and remain silent for a while. It slows down the computer system, but when it starts to act, it is easy to notice that something is wrong with the computer. However, you should not believe what these false pop-ups that come from Settingsafari.com virus state about your computer’s security status. Settingsafari.com ads announce that user’s Apple device is infected with adware/spyware virus and suggests to call a number provided in order to get assistance from computer experts. It threatens that user’s data is at risk, for example, credit card and banking information, passwords, logins, social media chat logs, private files, and that even user’s web camera is monitored by cyber criminals. Fortunately, these claims are deceptive. They do not provide any accurate information about your system status; you should know that this message is pre-written, and the same message pops up for every user whose computer gets infected by Settingsafari.com PUP. Plus, even if this computer parasite claims that the call is toll-free, it is a lie. In most of the cases, tech support scammers provide a premium rate phone numbers, so by calling such number, you risk losing a considerable amount of money, and not only because the call cost is high. The people behind this support scam are frauds, which can ask you to provide sensitive information to access your PC remotely. Be careful; their only aim is to make money by deceiving inexperienced computer users. If you see these ads by Settingsafari.com, please remove Settingsafari.com virus from your computer without a delay. You can do it manually or by using an anti-spyware program (we recommend Reimage). Such computer parasites mostly spread alongside frequently downloaded free programs. It means that you can install this adware parasite unconsciously even without even knowing about its existence. For this reason, you must carefully monitor the installation procedure of each new computer program. Avoid choosing Default and Standard (sometimes – Basic or Express) installation settings, because these settings usually include pre-selected authorizations of installing additional software alongside your selected program. Aim for Custom or Advanced option and then look for “recommended downloads.” These can be browser add-ons, free applications, games, toolbars, and other kinds of software. Refuse to install them by deselecting the checkboxes next to them. In the majority of cases, these optional downloads are highly unreliable programs, so it is advisable to refrain from installing them. You should get rid of Settingsafari.com malware without a hesitation. The pop-ups it produces are incredibly annoying, plus, these scary and pushy alerts can convince you or another person who uses the same computer to call the provided number. If you are really concerned about your computer’s security, consider installing a reliable anti-malware or anti-spyware software. Speaking of Settingsafari.com adware, you can remove it without any efforts with SpyHunter or another reputable anti-spyware tool, but you can also try to remove this threat manually as it does not require very high computing skills. You can find a comprehensive Settingsafari.com removal guide below. Just make sure you do everything as instructed and do not miss any steps. Otherwise some of Settingsafari.com virus components might remain on your computer and cause inconveniences in the future. Here, look for Settingsafari.com or any other recently installed suspicious programs. Wait until you see Applications folder and look for Settingsafari.com or any other suspicious programs on it. Now right click on every of such entries and select Move to Trash. When in the new window, check Delete personal settings and select Reset again to complete Settingsafari.com removal. Once these steps are finished, Settingsafari.com should be removed from your Microsoft Edge browser. Here, select Settingsafari.com and other questionable plugins. Click Remove to delete these entries. Now you will see Reset Firefox to its default state message with Reset Firefox button. Click this button for several times and complete Settingsafari.com removal. Here, select Settingsafari.com and other malicious plugins and select trash icon to delete these entries. Click Reset to confirm this action and complete Settingsafari.com removal. Here, select Extensions and look for Settingsafari.com or other suspicious entries. Click on the Uninstall button to get rid each of them. Now you will see a detailed dialog window filled with reset options. All of those options are usually checked, but you can specify which of them you want to reset. Click the Reset button to complete Settingsafari.com removal process. This entry was posted on 2016-04-05 at 07:26 and is filed under Adware, Viruses. You can quickly scan the QR code with your mobile device and have Settingsafari.com manual removal instructions right in your pocket. How did you remove Settingsafari.com?